how can you protect your ends while in twists? First and foremost, wear a satin bonnet or scarf to bed. Cotton pillowcases can make the ends of your twists dry and brittle. Next, make sure your ends are sufficiently moisturized. Lastly, if your twists brush your shoulders (or beyond), pin it up during the day. This minimizes snagging and drying of the ends from contact with your clothes. ... What products should you use? ... and should end papers be used to protect ends? No, end papers are not necessary. For other posts in the Twist Series, check this label. If you have questions you would like to be answered in the Twist Series, comment below. Hi there. You mentioned that you wear your twists 3-4 weeks at a time. 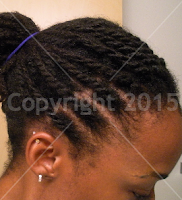 Do you wash your twist during this timeframe? If so, how often?